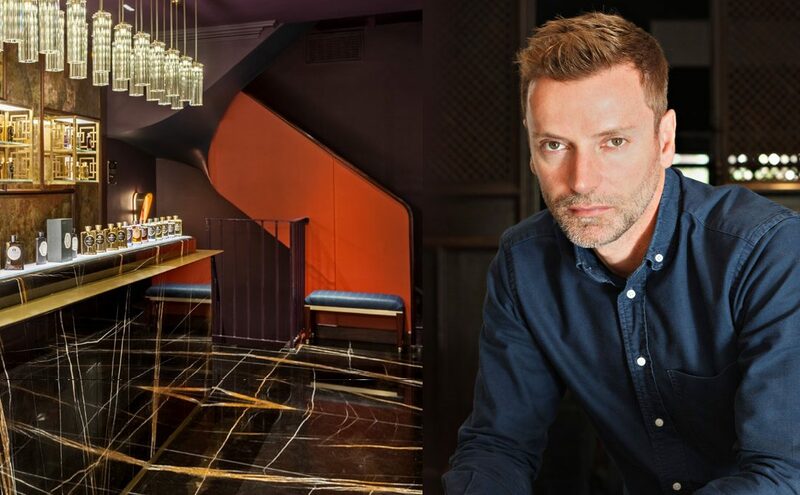 Scentury founder Helder Suffenplan travelled to London for the occasion of the grand opening of Atkinsons’ flagship store to sit down and chat with store designer Christopher Jenner, brand owner Dino Pace, and perfumer Julie Pluchet. London has often been dubbed the New Rome, a city at the epicenter of a vast empire teeming with goods, capital, ideas and people. Even with the empire gone and Brexit up ahead, you still sense that London is a place with infinite appeal, like few other cities on the planet. A Babylonian variety of language rises on the streets, above the purr of expensive sports cars and limousines gliding by on the streets, while elegant ladies out to lunch examine handbags, shoes, and other luxury items with a serene disregard for the endless zeros on the price tags. And history positively oozes out of every stone and every architectural icon lovingly maintained by its inhabitants — even more so by the new arrivals eager to blend in. 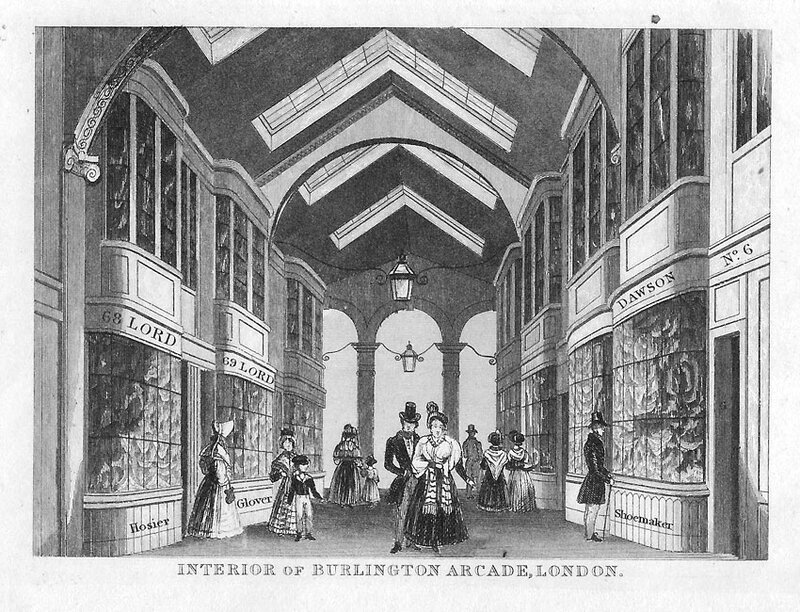 Antique steel engraving of Burlington Arcade, c. 1845. Via: www.mapsandantiqueprints.com. Burlington Arcade: a beacon of Britishness since 1819. At the very heart of this hustle and bustle lies the glamorous Burlington Arcade, a sparkling gem of a Mayfair mini-mall commissioned way back in 1819 by Lord George Cavendish — and ever since then a beacon of Britishness and premium goods. The Arcade is traditionally renowned for high-end jewelry and selected vintage watches. But in recent years, the straight top-lit walkway with its seventy-two small, two-story units has attracted Frédéric Malle, Penhaligon’s, Roja Parfums, By Kilian and other leading niche perfume brands. This year marks the return to Mayfair of a venerable and distinctively British perfume brand that has every right to be here. Atkinsons — the company founded by James Atkinsons in 1799, which makes it Britain’s second-oldest perfume house — is indisputably on “home turf” in this neighborhood, with its original store in striking distance at 24, Old Bond Street (an address immortalized by the eponymous cologne, and now the London base of Salvatore Ferragamo). 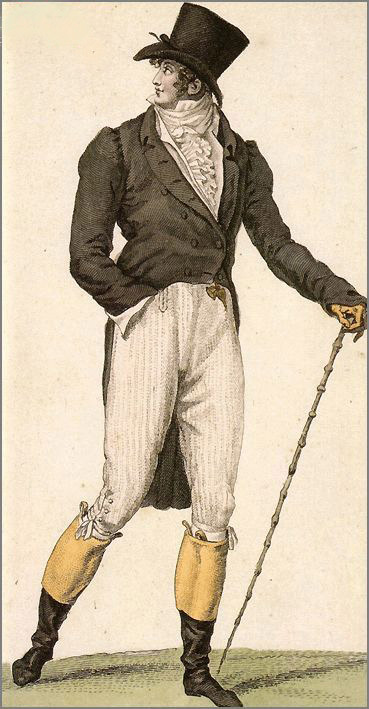 Beau Brummel (1778 – 1840), original Dandy and devoted user of Atkinsons perfumes. Via: www.homohistory.com. A magnet for contemporary heroes, heroines and dandies, created by Christopher Jenner. 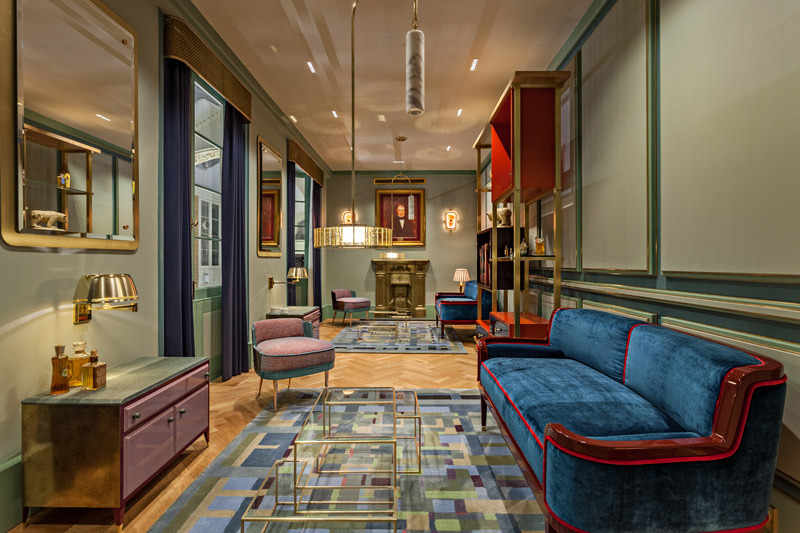 Responsibility for breathing new life into Atkinsons’ abiding love affair with Mayfair fell to London-based designer Christopher Jenner, who reignited the passion of the place, making it a magnet for a diverse contemporary cast of heroes, heroines and dandies. Only hours before the grand opening of the new (candle-lit! nighttime!) flagship store, Scentury founder Helder Suffenplan had the chance to sit down and chat with designer Christopher Jenner, brand owner Dino Pace, and Julie Pluchet, the nose behind the fragrance especially commissioned to celebrate Atkinsons’ return to its historical home, 41 Burlington Arcade. The second floor of the Atkinsons store at Burlington Arcade. Photo: Michael Franke. HELDER SUFFENPLAN: The Burlington Arcade is a really old building, dating back to 1819. But that same year, Atkinsons celebrated its first twenty years in business. Christopher, does working with a client with such a long history make life easier for you, the designer, or do you prefer to start with a blank canvas? CHRISTOPHER JENNER: A client who has no history, or no idea of whom or what they want to be can make life very challenging. I find it much easier to work with a brand like Atkinsons because there are all these elements to work with. You’ve got history, you’ve got loads of stories you can integrate in the design, and you’ve all these different eras you can research. You’re basically looking into what has happened previously so as to be able to transform it into something completely contemporary and of the moment. HS: How exactly did you find inspiration for the design of the flagship store in the history of the brand? CJ: The process was not about looking for a visual reference so much as about looking for a value reference. For example, all the items in this space are handmade by English craftspeople, who address, in one way or another, the challenges posed by a particular material or technique. In presenting their work, we align the brand with the same values that we find in quality craftsmanship: things like care, dedication and commitment, and the idea of a manufacturing culture as an ongoing process, as opposed to something stagnant or stuck in the past. Atkinsons is a cultural representative of England, so the key question has been how to re-energize that mission and bring new life and a new expression to our platform. 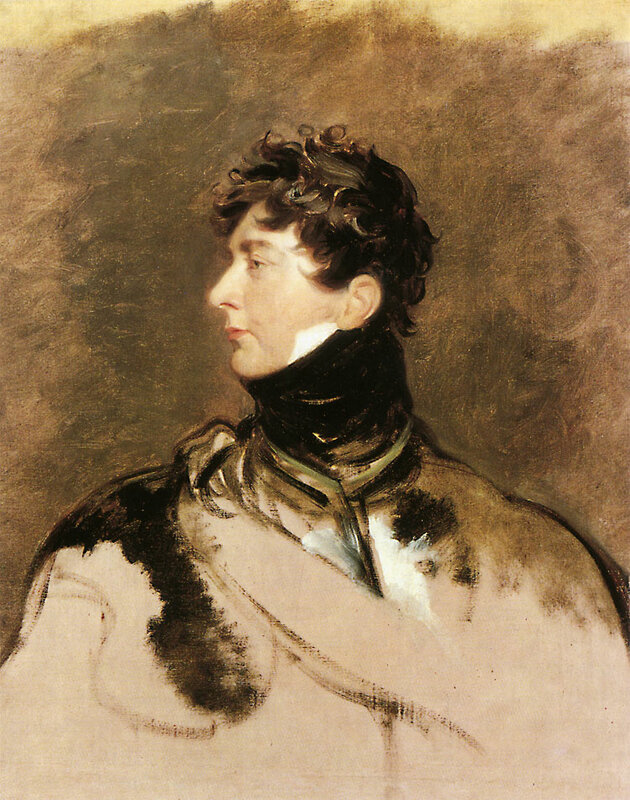 Portrait of George IV (1762 – 1830) by Sir Thomas Lawrence, c. 1814. Via: www.wikipedia.org. HS: Which sounds like the very opposite of creating a period piece — or a period setting — for a brand. CJ: Absolutely. What we definitely don’t want is to be a brand that lives in the past. Of course, we’ve identified certain characteristics that still resonate with us but we see them as a springboard for transformation into something fundamentally contemporary. So, yes, we tap into the values and sensibilities of the founding era, but then translate them into the language of the here and now. HS: We keep forgetting that people in bygone eras were once contemporary too. They probably felt quite modern and avant-garde in their day; and doubtless they were. CJ: Sure, and the Georgian period is the classic example. Modern notions of lifestyle and taste were more or less an invention of that era. CJ: People then clamored for novelty yet were meticulous about restraint. To me, that tension is the essence of design. If you look at English history, the Georgian era is one that witnessed a great flourish of creativity. Another important fact is that glass manufacture began then on a larger scale than ever seen before. This brought a lot more light into interiors, so it was an incredibly joyous, uplifting time. We really wanted to incorporate that mood in the design of this new store. It’s not about making a big style statement or being kind of austere. It really is about imbuing it with emotional sensibility. HS: The Georgian Era was also a time when influences — and wealth — flooded into Britain from all over the British Empire: spices, silk, and gold, as well as ideas. CJ: That’s true. It was somehow similar to what we now call globalization. For the first time, people were actually able to travel the globe and have a sort of cultural interaction such as had never, ever existed before, in the history of humanity. But I think the enlightenment was an even bigger influence: the newfound freedom within music, writing, art and architecture; the process of allowing society to break free of its really rigid, moral structures and embark on an era much more expressive in tone. HS: Is there a difference between creating an environment for a luxury perfume brand than, let’s say, for a fashion brand? Perhaps you have to exercise visual restrain so as to leave room for the olfactive experience? CJ: I don’t think there is a difference. It’s the quality of the experience that’s most important, not how it’s defined. All of our work is about craftsmanship. It’s really about epitomizing certain values; and this more humanist perspective on things, as opposed to a highly stylized public profile, invites people to connect. It’s all in the details! 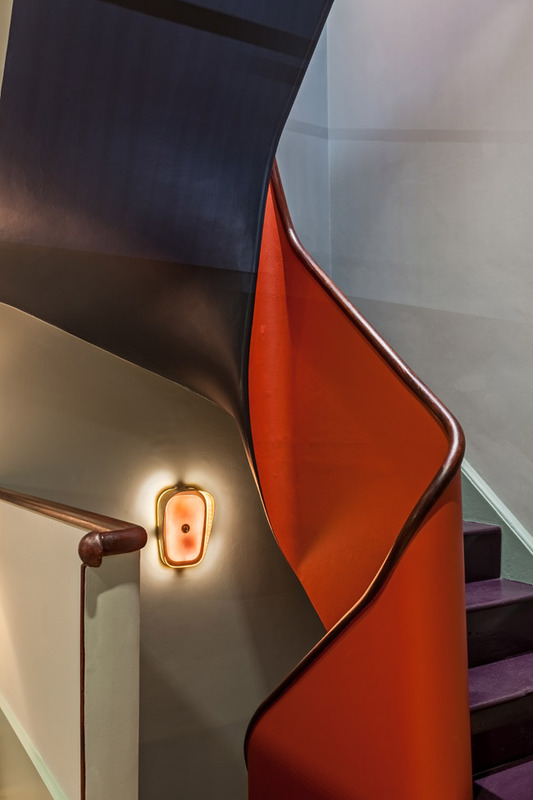 Staircase at Atkinsons new flagship store. Photo: Michael Franke. HS: Can you tell me a little bit about some of the singular items here in the store, and why you designed them exactly like this? CJ: I’d love to. The articulated wall-lights over there were handmade in Sheffield, a city that played a fundamental role in the Industrial Revolution. In the late seventeenth century Sheffield became known as the workshop of the world — primarily for metal implements, such as cutlery and cookware, which were shipped across the empire. But suppliers in Sheffield are now using state-of-the-art techniques, such as CNC cutting, to create much more contemporary impressions. The deal is to bring crafts and technology together to create a new platform for these techniques. HS: What about these couches we’re sitting on? They are amazing! CJ: These couches were hand-carved in Sussex then lacquered and upholstered in velvet. All the pieces here — and this is an essential point — are one-offs. There are only two of these wall-lights in the world, and only two of these couches. We’re really challenging and pushing craftsmen to achieve new shapes and forms in the same way a perfumer would, if ever given an Atkinsons brief. So developments here really reflect the company’s ideal: to challenge creativity as much as possible and to align that value with the brand. Store front of the Atkinsons flagship store at Burlington Arcade. Photo: Michael Franke. HS: I see iconography from various eras and places in certain details of the store design: a lamp with a hint of a mid-century touch, a brass table frame that echoes Asian arts. Is it characteristic of a true megalopolis like London to attract and digest all sorts of influences then take them in an entirely new direction? CJ: I think it’s definitely a London thing. Unfortunately, we are in the most difficult situation, politically, than we’ve been in for centuries. The Brexit issue is very unfortunate for this country. The economy’s going down the drain, our ability to accept foreigners into our society is at risk. Within the UK, London remains possibly the one place where there’s a chance for us to reclaim and reaffirm a tradition of acceptance and open-mindedness and to spark new ideas for the future. HS: There’s always been this idea of London as the New Rome, with an influx of goods, capital and ideas — and people hoping to find their luck. CJ: I guess we’ve just come out of our New Rome cycle. London really was the most important city for the last twenty years. So it’s quite interesting, after long living in a city with this completely global perspective, now to be told, who and what we should be, and who we should associate ourselves with. It’s going to create a few issues, I think. We’ll have to see how it goes. HS: We here are certainly a very mixed bunch of people, meeting up in London especially for this conversation. Dino, you’re an Italian who has saved a venerable British brand from oblivion; Julie, a perfumer from France; I’m from Germany; and you, Christopher, grew up in South Africa but spend time at various spots around the globe. What is the earliest olfactive recollection you have of your childhood, Christopher? CJ: Probably the smell of a freshly mown lawn. And I love jasmine, too. Jasmine was something we had in our garden all the time and that’s a really wonderful connection. 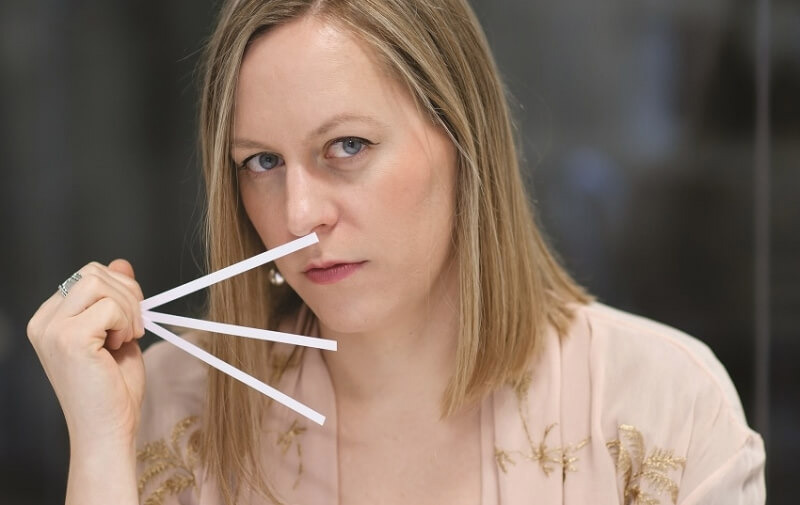 Julie Pluchet, the nose behind Atkinsons 41 Burlington Arcade. Via: www.cplaromas.com. HS: How about you, Julie? Julie Pluchet: I really like jasmine too, but I didn’t grow up with it. We lived in the countryside in the west of France while jasmine is more common in the south. So I originally associated jasmine with fragrance — it was only later that I discovered the flowers themselves. HS: 41 Burlington Arcade is the first fragrance you have created for Atkinsons and it’s an important one because it marks the opening of the flagship store and puts the return of the brand to London firmly on the map. What was it like for you, to work with a brand with such a colorful history? JP: I agree with Christopher that it is very rewarding to work with a brand that has so many elements to be inspired by, especially for a fragrance celebrating such a special occasion. I really wanted the customer to go: “Ah, this is a perfume that really smells like Atkinsons!” With this goal in mind, it was a challenge and a big responsibility, but also very interesting. Sometimes, when I work for a brand team who cannot make up their minds about what they really need and want, it can become very difficult. Especially these days, when even mainstream brands want to smell a little bit niche — but heaven forbid, not too niche! With Atkinsons it’s been very different because this brand is absolutely sure about wanting to be a niche brand. For me, it has been a really exciting project. 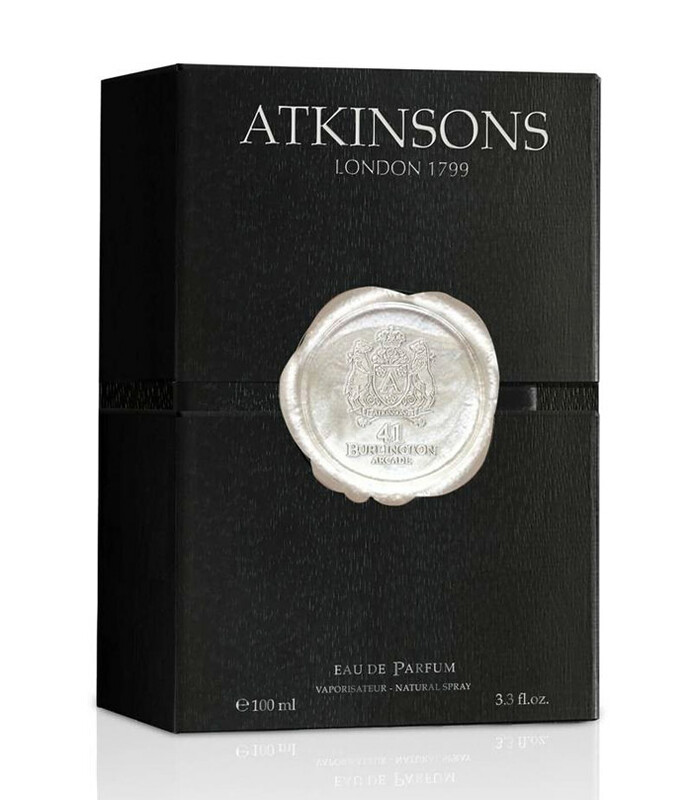 HS: Atkinsons was founded in 1799 and perfumery has changed a lot since then. Is it possible to translate the olfactive heritage of that era into modern creations? JP: Obviously, the formulas today are very different from the ones of the eighteenth century but some things stay the same, especially the desire for quality. For a brand like Atkinsons, one wants to use the most precious ingredients as well as a lot of naturals. Remember, back in those days there were no synthetic molecules at all. But even when using the same ingredients as existed back then, the approach is very different today. Technology changes and so does taste. So my concept has been to mix heritage with modern interpretation. 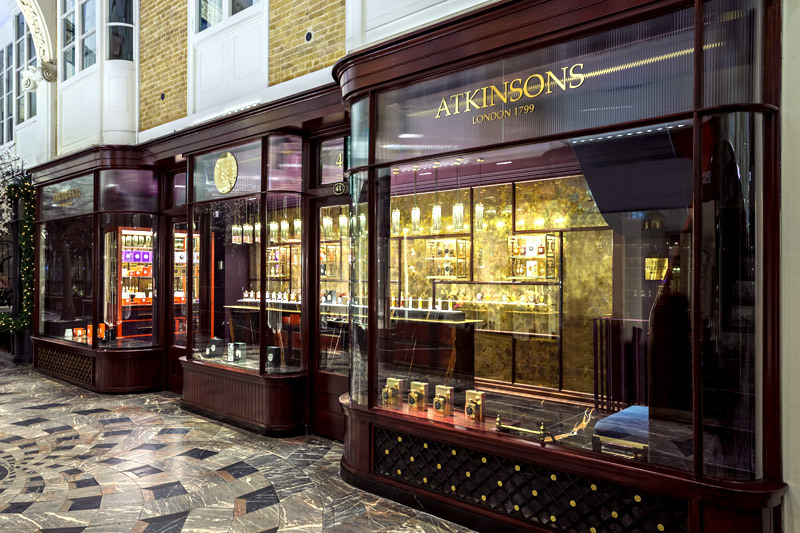 Atkinsons’ 41 Burlington Arcade, created by perfumer Julie Pluchet. HS: In the eighteenth century, fragrance was available only to a very few people. Today it has become a mass commodity. Also, the environment today smells very different. Has the role perfume plays in society changed? JP: I am sure it has. London certainly didn’t smell very nice in the eighteenth century. Historically, perfumes were used to cover up bad smells. People were afraid to use water on their skin because they thought water could transmit diseases. So they used perfume, not primarily for pleasure or to express their personality, but so they didn’t need to wash! So yes, the purpose of perfume has definitely changed. HS: And it has become much more individual. The sheer number of brands and fragrances available these days is overwhelming. JP: But this doesn’t mean each of those fragrances is unique. There are many brands and products to choose from — but not that much choice when it comes to uniqueness. Especially in the mass market, there is nothing really unique and new. That is why I like to work with a brand like Atkinsons, because it gives me more freedom. For 41 Burlington Arcade I was able to use high quality ingredients as well as to explore how to use them in more creative ways. 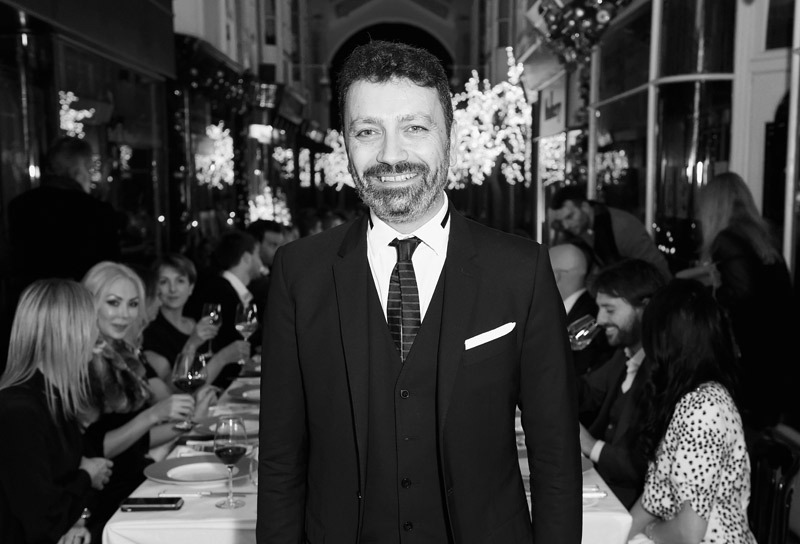 Atkinsons brand owner Dino Pace at the Burlington Arcade candlelight dinner. Photo :Dave M Benett, Getty Images. HS: Big brands do a lot of market research to make sure a new launch will be successful. Let me ask you, Dino, who is involved in the development and evaluation of the Atkinsons fragrances? I presume you don’t do focus groups. DINO PACE: Definitely not. We sometimes involve our top customers but we don’t do focus groups or consumer research. The purpose of a niche fragrance is not to please as many people as possible but to please our particular circle of customers. Actually, everything begins with a brief from the brand manager. Then the R&D department will get in touch with different noses and fragrance houses to find out what perfumer might be best for the particular brief. And then, after a while, we have lots of samples that we have to shortlist before taking the final decision. HS: It’s a very long process? DP: Absolutely. A wise man once said that luxury is all about detail. You need to be able to control every single detail to achieve the result you want. And this work never ends. HS: How exactly did it happen that you acquired the license from Procter & Gamble to relaunch Atkinsons? Have you always been interested in the brand? DP: It was available because Unilever and then Procter had tried to develop it on a global scale. Both are huge multi-national companies and so they tried to push it into the mass market. They didn’t understand the immense potential of the brand and they underestimated the development of the niche market. And their disappointment with the brand was our chance to acquire the license. We browsed Atkinsons’ impressive archives and immediately realized there were opportunities to give the brand a completely new start. I am very happy to say we were right. After only a few years Atkinsons is going strong step by step, and steadily expanding. HS: What will be the next steps for the brand? More stores? DP: It’s not just about having more points of sale — we need to think in the long term. We have to be very careful about expanding distribution; after all, we’re a niche brand. Other things are just as important. This is the era of social media so we have to build our social channels, our website, and our e-commerce. And it’s essential to work only with marketplaces that are really and truly niche, so as not to squander our products. That’s a huge issue these days. 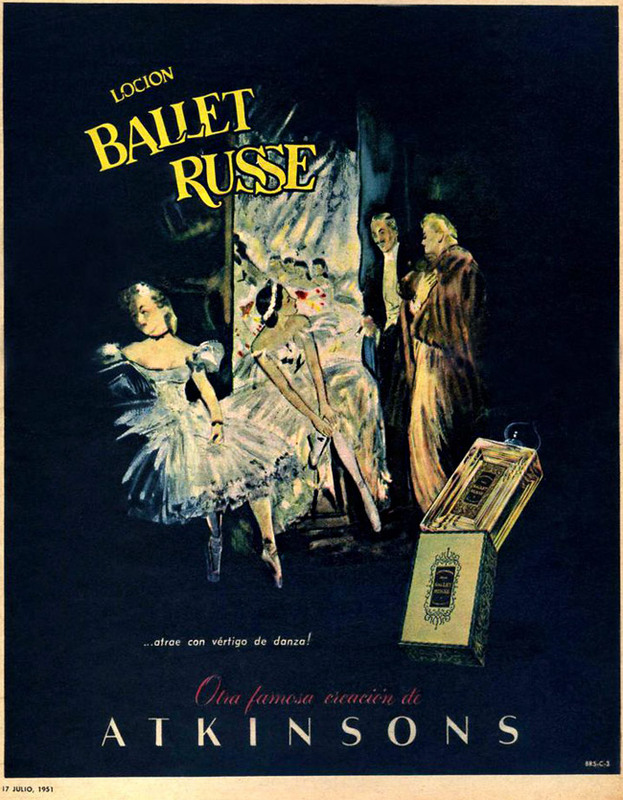 Vintage ad for Ballet Russe by Atkinsons from 1951. HS: I wanted to ask all three of you whether you recall the first fragrance you chose and bought for yourself? CJ: I think mine was Jazz by Yves St Laurent. I probably liked the black and white bottle — so completely 80s, wasn’t it? Hilarious! HS: What was your first personal fragrance, Dino? DP: It was Paco Rabanne Pour Homme, because it was the fragrance my father used. It’s still a classic. How about you? HS: It was Feeling Man by Jil Sander, one that unfortunately has been discontinued. It came in red packaging and the liquid was a pale purple. The smell was fruity-woody with raspberries and grapes: unique. I wish I could smell it again. How about you, Julie? JP: When I was a teenager I had plenty of fragrances, an entire collection. I think the name of the first one was Delicious, with a lid in the shape of a tiger. HS: So it was clear at an early age that you would spend your life creating fragrances? JP: I definitely was into perfumes and smelling, at a very early age, but it wasn’t until I saw a French movie with Sophie Marceau that I discovered the profession of perfumer actually exists. Marceau plays a student in a perfumery school in Versailles. So when I saw the movie I said, this is the job I want to do! HS: Where is your collection now? JP: It’s in a box at my mom’s house. I move home very often, so at least I know it’s safe with her. HS: Waiting to be rediscovered, like an olfactive time capsule. JP: One day I will go and look at it. It will be a very emotional moment. HS: Thank you, Julie, Christopher, and Dino! Veteran model Jan de Villeneuve at the Burlington Arcade candlelight dinner. Photo :Dave M Benett, Getty Images. Actress Olivia Grant at the Burlington Arcade candlelight dinner. Photo: Dave M Benett, Getty Images. Style icon Jan de Villeneuve, model and dancer Eric Underwood, artist Daisy de Villeneuve. Photo: Dave M Benett, Getty Images. Atkinsons brand owner Dino Pace with model Erin O'Connor. Photo: Dave M Benett, Getty Images. To find out where to find Atkinsons products at a perfume store near you, check out this store locator: www.top-exclusive.de.